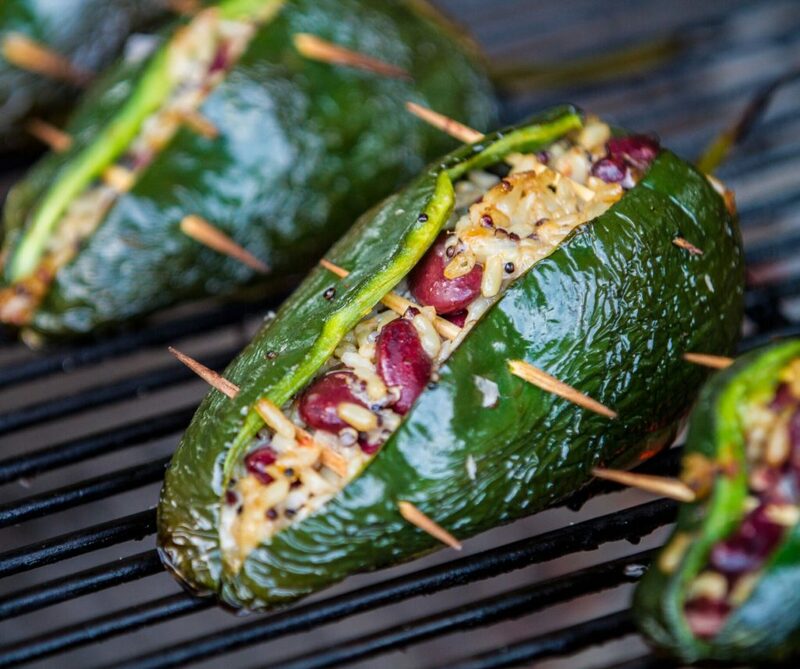 One of the first posts I wrote on Local Food Rocks was about making grilled stuffed poblano peppers. This year I decided not only to grow my own poblano peppers, but also to revisit my original recipe. Poblano peppers have thick walls, making them perfect for stuffing and grilling. They get a wonderful smoky flavor when grilled and their mild heat also adds another dimension to a simple stuffing. The hardest part is actually slicing and stuffing the peppers. Be careful not to cut all the way through the pepper and try not to overstuff them. I kept the recipe vegetarian-friendly, but you can certainly add ground meat to the stuffing if you prefer. If you have extra stuffing, that’s OK. It’s good on its own as a leftover. Heat coconut oil in a large sauté pan over medium heat. Sauté onion until translucent. Add garlic, hot pepper and tomato. Sauté another 5 minutes. Place cooked vegetables in a large bowl, along with kidney beans, cooked rice and cheddar cheese. Stir until well combined. Lay the poblanos flat (the way they naturally sit without falling over) and cut a T-shaped slit into each pepper. Slice horizontally along the top, then lengthwise down to the tip. Be sure not to cut all the way through the pepper. Then, using your fingers, gently open the split and pull the seeds out. Spoon the bean and rice mixture into the cavities of the split poblanos. Use a couple of toothpicks to hold the peppers together along the seams. Heat grill to low-medium heat. 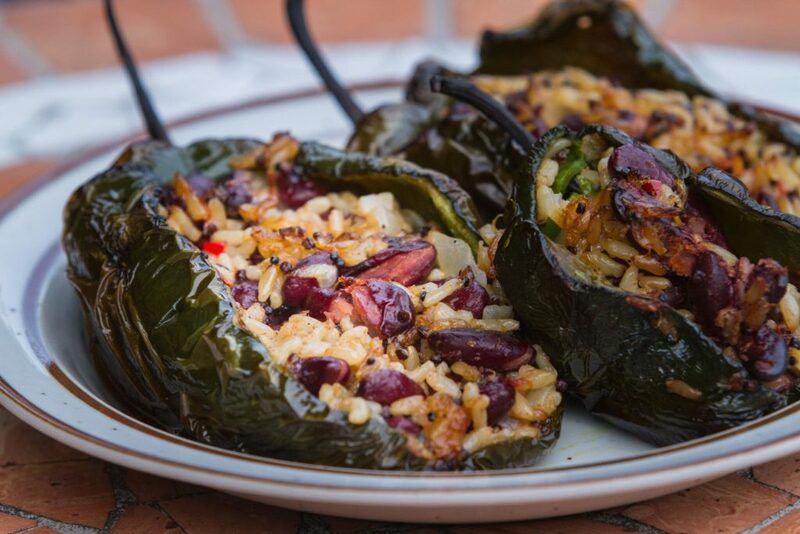 Gently place stuffed peppers onto the grill and cook for 20-30 minutes, until they are softened. If using a charcoal grill, bank the coals to one side and cook the pepper using indirect heat.